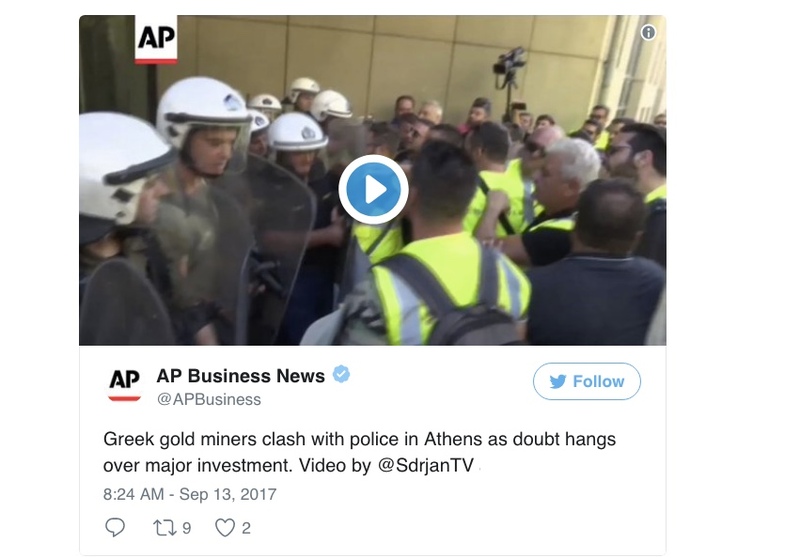 A group of Eldorado Gold (TSX:ELD)(NYSE:EGO) workers clashed with Greek police Wednesday outside government buildings in Athens during a protest against potential job losses, following the Canadian miner’s decision to suspend operations and investments in the country. The Vancouver-based company, Greece’s biggest foreign investor, announced the potential halt Monday, adding that except for maintenance and environmental activities all other work would stop on Sept. 22 unless long-delayed licenses were issued in time. The company, which employs more than 2,000 staff and contractors in the country, noted at the time that if the shutdown took place all but 300 workers responsible for maintaining mining facilities would be laid off. About a dozen miners managed to push past police and enter the building, while riot police fired tear gas to push back at them, Reuters reports. A delegation from the protesters later met with Environment Minister Giorgos Stathakis, who after the talks said three pending permits for Olympias, one of the miner’s projects awaiting licences, would be issued this week. The documents, he noted, would allow Olympias to be fully operational. 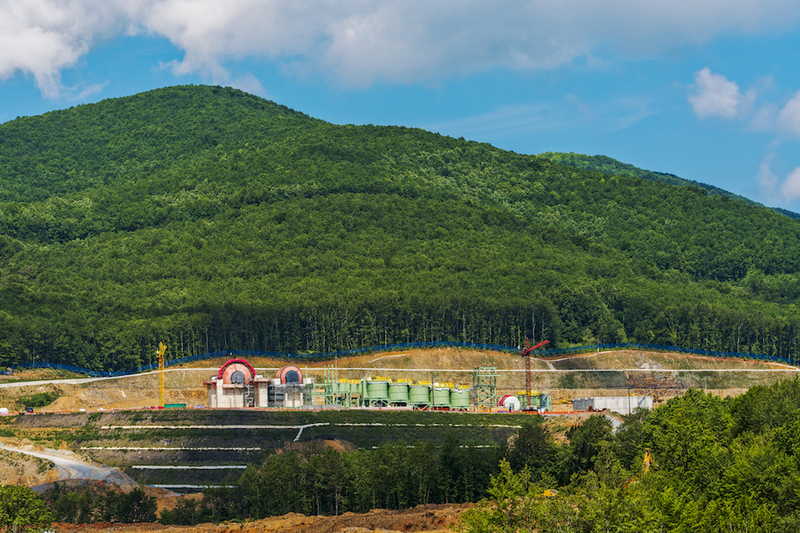 Later in the day, Eldorado confirmed the reception of two key permits from the minister — the Olympias Operating Permit and the modified Electromechanical Installation Permit for the tailings management facility at Kokkinolakkas. The gold miner noted it's still waiting for the approval of the technical study for the old Olympias mine closure and the installation permits for the paste plants at Olympias. The amended electromechanical installation permit for the Skouries flotation plant is also pending, it said in the statement. "The company is also awaiting additional detail from the Greek Government regarding the pending arbitration process, which the government has publicly indicated that formal notification will be issued on 15 September, 2017," it said. "We are confident that any potential arbitration will again demonstrate Eldorado's adherence to all applicable laws and regulations and its commitment to developing its Greek assets safely, responsibly and with utmost care for the environment," Eldorado's President and chief executive George Burns said. 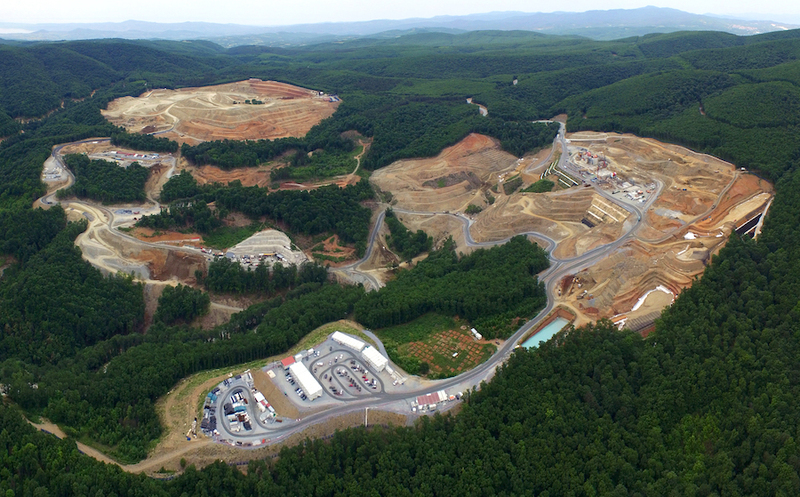 The permit for Skouries, covering the construction of a smelter on site, where a gold extraction project is under development, won't come as soon though. The licence has been delayed because of differences between Eldorado and the ministry’s technical experts regarding testing methods applied to comply with environmental regulations. Stathakis said earlier this month that issue would be settled by arbitration in a Greek court. Canada's trade minister Francois-Philippe Champagne said Wednesday he's working with Eldorado to help it solve the impasse with Greek authorities. "As trade minister, is my job to support Canadian companies when they face a particular situation which would be either unfair or questioning the treatment that Canadian companies would have," Champagne told Bloomberg. "I will always intervene and always will have the back of Canadian companies when they face unfair situations around the world," he noted, adding he doesn't not expect issue to impact implementation of the Canada-EU trade agreement. Eldorado's decision to freeze investments in Greece will also be discussed this Friday at the Eurogroup meeting, in Tallinn, Estonia, a euro area official told Bloomberg on condition of anonymity. 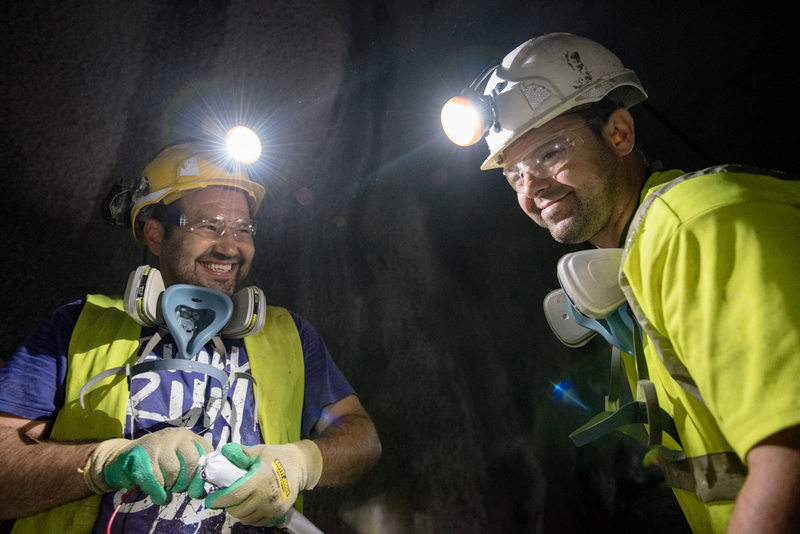 Eldorado, which already operates Stratoni, has been trying to develop the Skouries and Olympias projects in the north of the country for years, but local opposition and an ongoing back-and-forth with authorities have delayed progress. This is not the first time Eldorado has halted operations in Greece. Last year, it suspended work and laid off 600 miners following a fall-out with the government. Activities resumed about five months later. Eldorado’s impasse with Greece will put to test the left-wing Syriza government’s new policy of welcoming private investment, or what prime minister Alexis Tsipras calls “Grinvestment”. Shares in the company jumped more than 16% on today's news, and were trading about 14% higher in both Toronto (14.11% to Cdn$275) and New York (13.67% to $2.24) before 10:30 am ET.